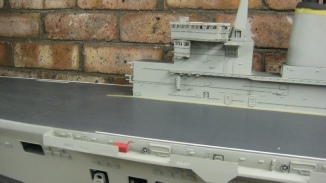 I currently have a 1/96th scale I Class carrier for sale. HMS Invincible. Even though she was built as a static she was fitted with the correct running gear so could be converted to R/C, all the cutouts are highly detailed, I will supply the rest of the fittings required to complete as part of the price. If you require any more information then please call me 07791 440 641. Fleetscale hull £168.00, Fleetscale running gear £135.50, Plan £54.00. Full set Sirmarfittings £464.81. Total £821.81. That does not include any pnp. I can deliver it mainland UK only depending on distance and price. Its up for sale at £1,100 or a sensible offer.